Is The Day After Tomorrow Really Happening? 1. Leslie Mann in "Knocked Up"- I really think I kinda fell in love with actress Leslie Mann after seeing her in this movie. I recognized her as the psycho drunk that almost scores with the 40 Year Old Virgin (and she was hysterical there as she is here) but she brings something new to her role in Apatow's latest. The interaction between her and Paul Rudd is priceless, and when things get a little real (such as when she's not allowed into a night club because she's "old") her humor gives way to some precise emotions about growing older. 2. The first image of The Host rising out of the river- Nothing compares to this stunning 4 minute sequence in Bong Joon-Ho's "The Host" as the 'thing' rises out of the water and wrecks havoc on the passer-bys. 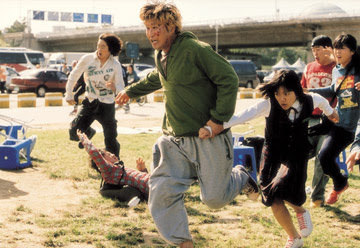 Joon-Ho graces the whole event in a long tracking shot that's elegant, chaotic and intense at the same time. And, this is probably the first monster movie in history to reveal the creature in its first appearance, and in broad daylight no less. It speaks volumes about the film's pretentiousness. 3. Actress Imogen Poots in "28 Weeks Later"- For the first time in the history of zombie movies, actress Imogen Poots took the focus away from the zombies and gave us a fully realized and fierce performance as the heroine. Reminiscent of a young Rebecca Gayheart but with acting chops, Poots held my attention every time she was on screen. She has some of the most intense eyes on an actress I've ever seen. I look forward to whatever she does next. 4. The swan in "Hott Fuzz"- There's alot to be said for a running gag in a comedy, but when it works quite as well as it does in "Hot Fuzz", it becomes comedy gold. 5. Actress Carice van Houten in "Black Book"- If the above image doesn't sell you on the genuine beauty of actress Carice van Houten, then you're blind. And like every other actress on this list, they earned their spot here. In "Black Book", Verhoeven manages to expose van Houten to every possible type of degradation and deceit during her campaign as a Jewish spy during World War 2. But, she holds up well and manages to portray her character with style and dignity. The following is my addition to the Film Music Blogathon at Windmills of My Mind. We all understand the importance of music to films. Hell, the idea behind soundtracks now exists in every facet of our daily lives. Who doesn't have an Ipod stuck in their back pocket so we can instantly change the soundtrack of our hum-drum days? The fact that music presents us with a varied catalog of emotions and feelings speaks directly to the innate ability of movies to reach us on a basic level. We've all watched a movie where the soundtrack is often more involving than the film itself. And, when a soundtrack is REALLY good, it not only punctuates the strength of the moment, but it rattles around in our heads for days, refusing to loosen its grip. The music of Georges Delerue has been rattling in my head for several years now. First off, a quick list of some films that Delerue has composed the soundtracks for: "Platoon", "Salvador", "Contempt", "The Conformist", "Silkwood", virtually all of Truffaut's films, "Beaches", "The Black Robe" and "True Confessions", plus over 300 other various film and television projects dating back to the early 50's. Prodigious, yes, but not well known, even though he won an Oscar in 1980 for his score to "A Little Romance" and was nominated 4 other times for "Julia", "Day of the Dolphin", "Agnes of God" and "Anne of a Thousand Days". The lack of recognition shouldn't be surprising. With the exception of James Horner, Bernard Herrmann, John Williams and possibly Howard Shore, there aren't that many composers who break into the global limelight unless they pen a true honest to God classic (think Williams and "Jaws"). Delerue, like so many other composers, harbor a deep passion for relating images to sound and they often go about their business in relative anonymity. But for me, Delerue burst into my global limelight about thirteen years ago. Being the Godard nut I am, I was quickly burning through his oeuvre of playful, revolutionary 60's films when I rented 1963's "Le Mepris" aka "Contempt") from the local Blockbuster. I turned it on and from the opening moments, Delerue's theme wafts across the images with such a stunning clarity. I re-watched "Contempt" 3 times that weekend, falling in a deep obsession with the film's soundtrack. I quickly checked out this French composer, born in 1925, and saw that he worked largely with French filmmaker Francois Truffaut. So, Truffaut films it was. I think this was the first time in my formative years as a movie lover that I was guided through the images of certain films by a composer rather than the true auteur, the director. From there, I traveled back to Oliver Stone who employed Delerue on two of his films, "Platoon" and "Salvador". I was slowly being seduced by Delerue's lyrical and haunting music. It seemed to hit a pitch perfect harmony with the brutal images of death and destruction presented by Stone. Then there came Delerue's arrangement of Samuel Barber's Adaggio For Strings in "Platoon" that defies words. This was a man who understands the powerful suggestions music can have on the human soul. I was hooked. There was no looking back. Georges Delerue was and is my favorite composer and his music often deepens my appreciation for the images they accompany. That can't be said for many. But the theme that, in my humble opinion, defines the nature of Georges Delerues is known as "Theme de Camille" from "Contempt". It's a hypnotic, lush tune that replays itself over and over during Godard's exploration of a marriage disintegrating between two very beautiful people (Michel Piccoli and Brigitte Bardot). "Theme de Camille" has no other mission in the film than to play as a backdrop against the pulling and tearing of emotions and conversations that exist between the feuding couple. In one instance, it serves as a poignant exclamation of sincerity as Piccoli (and Godard for that matter) lingers over the naked body of Bardot, telling her that he loves each and every inch of her. Later in the film, the theme acts as a mournful elegy as Godard's camera tracks around the wreckage of a vehicle. Like the best of Delerue's theme songs, his music is a multi-purpose, not content to point the listener (and viewer) in one direction. His music takes on a variety of purpose. It's mood music at its best. The enduring legacy of "Theme de Camille" has surfaced over the years, resurrecting itself in commercials for Chanel, compilation movie clips, and even sampled in the soundtrack of Martin Scorsese's "Casino" in 1995, no less during an emotional high point that corresponds with the violent outburst between man (DeNiro) and woman (Sharon Stone) as their marriage disintegrates. It's a sly nod to Godard's earlier use. Delerue would go on to create other masterpieces (as evident above when I listed just a few of his credits) but "Contempt" is something altogether different. Delerue died in Los Angeles in 1992 and he's a composer who never really got his due. Was it because he worked largely in France? Still, placing the musical framework to 90% of Truffaut's films should earn him something. Or have we, as a collective group, become somewhat indifferent to the accomplishments and additions of the film composer? Quite often, a film's score will put it over the top for me. Is there a better modern soundtrack than Jon Brion's expressionistic layers in "Magnolia"? Or the music of Michael Nyman (and I'm thinking specifically of his work in "Wonderland", "The Claim" and especially "Gattaca"). Or what about the oft-hated build ups of sound produced by Philip Glass, a composer whose work often threatens to overtake the film's actual drama but feel so perfect to me? These are just a few examples of the brilliance inherent in film today. Delerue is in a class all by himself. He wasn't showy or pretentious. His music is crystal clear, rendering the many emotions of film viable through sound. Instead of just adding a soundtrack, he often added heart and complexity. And that's the greatest compliment a composer can receive, whether he's popular or not. Over the weekend, something interesting began happening across the blog universe. Dennis at Sergio Leone and the Infield Fly Rule mentioned a few blogs that make him think. This was in response to a seperate blog naming Dennis as a blog they often read. The whole affair can be traced back to its humble beginnings here, but the idea is simple- its yet another way for the community of blog-o-spheres to call out niches of interest in this ever-expanding and exciting forum. And it's been virusing all across blogs ever since. So, I'm pleased to announce that this little blog has been mentioned in the list of Jim's at his Talking Moviezzz blog and the activity will be reciprocated with my own list. 1) If, and only if your blog is one that is tagged on a list, you must write a post with links to five other blogs you like that consistently make you think (hence, the Thinking Blogger’s Award). Drifting- Not only is the writer of this blog, David Lowery, a Dallas native such as myself, but also an accomplished short film maker and writer in these parts. But, he doesn't wallow in self serving enterprises, instead shifting the focus of his blog onto other filmmakers, such as when he posted a lengthy interview with director Charles Burnett or posts the latest P.T. Anderson clip. Drifting is essential reading. Better Than Fudge- Writer Josh Horowitz has a real life writing about films for MTV and other publications, and his blog is a great diversion for film related matters, You Tube posts and some of the funniest pictures you'll surf across on the web. If you don't want to take things to seriously, Better Than Fudge is just what the doctored ordered. Noel Vera blog- Writer Noel Vera brings us reviews from all over the world, and none as entertaining as his recent dispatches from the Jeonju Film Festival, including thoughts on the festival as well as pictures from his experiences (as a jurt member). This is why I read blogs- to open myself up to places and people that, otherwise, I'd never know. And Vera does a fantastic job of giving us glimpses into foreign worlds with texture and prose. Coffee Coffee and More Coffee- Another writer who often brings us excerpts from foreign worlds (as he used to reside in Taiwan), Peter Nellhaus has been writing about film for major publications for years now, but none as intimately as within his blog. Everyday there's a new found gem on his blog, reviews from films I've never heard of and screengrabs that jump off the page. Another invalubale source of great info. Trashcan Odorous Jr blog- Though his posts are infrequent, one of my best friends and one who can shed some insightful thoughts on everything from politics to TV. And I imagine he's working on some great posts about "Deadwood" and "Carnival" right now since he finally discovered the unlimited joys of Netflix. So, there's 5. Link and enjoy and carry on the "Thinking Blogger" torch. And thanks Jim for the mention! While watching William Friedkin's psychological thriller, "Bug", it's clear to see why he's such a maligned director. He never goes for the easy pass or commercial venture. In a certain way, he's still stuck in the 70's and 80's (as visual and audio references to both Sergio Leone's "Once Upon a Time In America and Coppola's "Apocalypse Now" reveal in the first 5 minutes). And while I don't fully accept "Bug" as a terrific movie, I do admire the thematic and dramatic pose of the film. In a few words, this is one mentally damaged piece of work that has great potential of being a midnight movie in the years to come. Even though the first hour is painfully slow, Friedkin picks up the pace dramatically in the second half and begins to create a bipolar narrative that's as weirdly divided as the protaganists. Written by Tracy Letts and based on his play, "Bug" clearly identifies its minimal setting (the motel room and 2 minutes in a bar) and director Friedkin does his best to open things up when possible. There are several startling moments when the entire location begins to vibrate and explode as outside danger (basically meaning real people knocking on their motel room door) threatens Peter and Agnes' confined dementia. "Bug" is not for all audiences, but it does offer up a diverse offering for anyone wanting something a little more cerebral than that Pirate movie playing on 12 of the 16 multiplex screens. And don't forget to stay through some of the credits which features a quick shot that forces the viewer to re-imagine everything they've just seen and analyze what's real and what's not. Judd Apatow's "Knocked Up" carries forward his adult sense of humor with even more warmth and comic brevity than his previous film, "The 40 Year Old Virgin". Focusing on the unexpected woes of childbirth and impending adulthood rather than the simple idea of getting laid, Apatow chronicles the whole ordeal with a mature perspective. Amongst all the fart and bong jokes, there's a clearly defined, complex structure of men AND women that exceeds the (sometimes) juvenile offerings. I guess in this competitive film generation, one has to draw both age group audiences for a film to be successful, so alot of Apatow's less than intelligent laughs can be forgiven. But, I still believe adults will be far more entertained than teenagers. There's a few too many truthful moments here that only those who've lived it can appreciate them, none moreso than the scene where Heigl and her sister played, by Leslie Mann who STEALS this movie, are denied access to a hot night club because one is old and the other is pregnant.This is a film for any 30-something still feeling their way through life, unsure if they've made the right decisions and dealing with their mistakes the best way they know how. It's not only a magnificent comedy, but a pretty damn good representation of MY age group. I'm not sure what I expect out of a sequel (the third) from a remake of a movie made in the 60's. Yes, you read that right. And the criticism that was leveled against the first 2 modern Rat Pack movies holds true with "Ocean's Thirteen"- it most certainly looks like it was more fun to make than to watch. If getting the opportunity to see George Clooney, Brad Pitt, Matt Damon, Don Cheadle and Casey Affleck wear funny costumes intertwined amongst $1000 suits, then "Oceans Thirteen" is for you- and not all that different from the first 2 lackluster Ocean pictures. This time the motivating factor is revenge. William Bank (played by Al Pacino who appears to be sleepwalking through his flamboyant role) has double crossed one of Danny Ocean's (Clooney) partners. The boys team up to scam the casino on opening night in both inventive (timed slot machines and rigged dice ala a lighter) and extravagant (i.e. ludicrous) methods. And that's it. For the remainder of the film's 2 hour and 5 minute running time, we get the prvilage of being in on the joke with the Ocean crew as they toss out sprinkly dialogue ("I'll do the McGilroy" and "Told you it's always a Susan B. Anthony") and cruise around Vegas looking ultra cool. I'm probably not hiding my disdain for "Ocean's Thirteen" that well, but the fact of the matter remains "why?" Why does director Steven Soderbergh feel the need to toss off another wacky commercial venture with a high profile cast? Is it to complete his cycle of financing indie projects with the stakes of his more Hollywood fare? Or is there some other reason, as I stated in the first sentence? Is "Ocean's Thirteen" the boys' expensive way of getting together, throwing back drinks and spending 25 days in Las Vegas? Either way, they could've done that without producing such a boring picture in the process. First, a little backstory here. If you've seen "Reservoir Dogs", then you might notice the face of the one criminals in that film (I believe it's "Mr Blue") has a supporting role in "Straight Time". Tarantino was an avid admirer of "Straight Time" and plucked this actor, Eddie Bunker, out of thin air and gave him the small supporting role in that 1992 film. Bunker, a career criminal, wrote the book that "Straight Time" is based on, and while its an engrossing character study, its also a very tough and knowing look at what it must feel like to be institutionalized from a precinct of life (i.e. prison). Hoffman is a method actor and while his style tends to be a little cynical at times, he nails the performance in "Straight Time", as does every other actor who graces the film with their presence (namely Harry Dean Stanton, Gary Busey, M. Emmett Walsh and a stunningly beautiful and young Teresa Russell). "Straight Time" is a hard-edged look at criminals and the uphill battle to stay sober and straight, creating an ironic title. Not only does the film chart the lead characters slow descent back into a life of crime, but it creates an anti-hero that we sorta feel sorry for, mis-trusted by the system and shoved aside from normal life. This is one of the great unheralded gems of the 70's. Christ Stopped At Eboli- This is one terrific film by Francesco Rosi. I've seen 4 of his films now, and I'm beginning to understand that no Italian director comes close to the understated beauty he presents with each film. His is a proletarian view, often giving much more empathy with the peasants who mill around in his films rather than larger figures. In "Christ Stopped At Eboli", Rosi follows the life of exiled writer Levi as he takes residence in a small Southern Italy town. There's no real plot to speak of, only following Levi as he listens and makes friends with the townspeople. They dazzle him with stories about history, expose him to small town rituals (in themselves VERY fascinating tidbits about a lifestyle that no longe exists) and accept him as an outsider and eventual town doctor. This is minimal filmmaking, on par with the quiet, studied films of Manuel Oliveria, and another one of the best films of the 70's. Rosi is due for a MOMA re-discovery, at the very least so films such as "The Mattai Affair", "Illustrious Corpses" and "Lucky Luciano" will get a DVD release. 1. Chan Is Missing- One of Wayne Wang's first films that just came out on DVD a little while back. I've been looking for this one for quite a while so I'm excited to finally catch a glimpse. 2. The Man Who Never Was- Intriguing sounding British WW2 film about a conspiracy to mislead the Germans about a military landing in Greece. A friend recently re-counted the entire true history of this story and it sounded fascinating. 3. The Dam Busters- Another British war film that documents the conception, building and eventual use of "bouncing bombs" that were used to hit Nazi reservoirs and flood portions of their cities. British war films are usually a grab-bag... but this one has a nice angle. It should be a nice companion piece to the previous film on this list. 4. Crazed Fruit- Yashushi Nakahari's nouvelle vague look at disaffected youth in postwar Japan. I know nothing about this film except for a stellar write-up from Aint It Cool News a long time ago. 5. Prime Cut- Michael Ritchie's 70's exploitation flick. 6. Loud Quiet Loud, A Film About the Pixies- Being a huge Pixies fan, I don't see how this documentary can go wrong. 7. Savage Cinema: Defenceless-Another odd ball choice that came recommended from a couple of Netflix friends. Directed by a man named Mark Savage, I've got 4 films of his in my queue. They're supposedly pretty raw and tough exploitation films that have grown a cult following in their native Australia. Once again, the joys of Netflix can bring home some unheralded gems or utter trash. The jury is still out on this one. I'll keep everyone updated! 8. 1900- Bertolucci's epic film (i.e. clocking in at 5 hours) has finally made its way out of the basement of edited versions and given a proper release on DVD. I watched part of this film when I was much younger and going through a Robert DeNiro phase, but didn't appreciate the style and grandeur of Bertolucci's vision. It's time to give this film another shot. 9. Sensitive New Age Killers- Another Mark Savage flick.